Mark Dobmeier collected his 3rd River Cities win of 2014 Friday night. 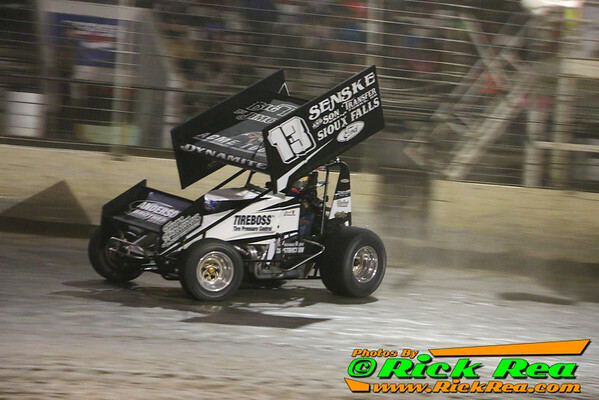 GRAND FORKS, ND (July 4) - Jordan Adams of Reynolds, ND led the early going of the 24 car NOSA 410 Sprint Car feature at River Cities Speedway. At lap eight, however, he had a challenge for the lead from rookie driver Amber Balcaen while trying to maneuver through lapped traffic. Adams was able to hold off the charge from the Apex Motorsports #10, but then the caution flag flew on lap 10 which put Mark Dobmeier on his rear nurf bar. As the race went back to green, "Dynamite" Dobmeier took off like a rocket on the cushion and stormed past Adams' WinField #20. Within a couple of lap Dobmeier had opened up a full straight away advantage and cruised to the victory. The win was Dobmeier's third consecutive in as many days. Wednesday night's win came at Huset's Speedway in Brandon, SD with the World of Outlaws STP Sprint Car Series. The win was Dobmeier's third with the top Sprint Car touring series. Thursday night's win also came at Huset's during local weekly competition. Dobmeier will shoot for his fourth consecutive win Saturday night at Knoxville Raceway in Knoxville, IA.